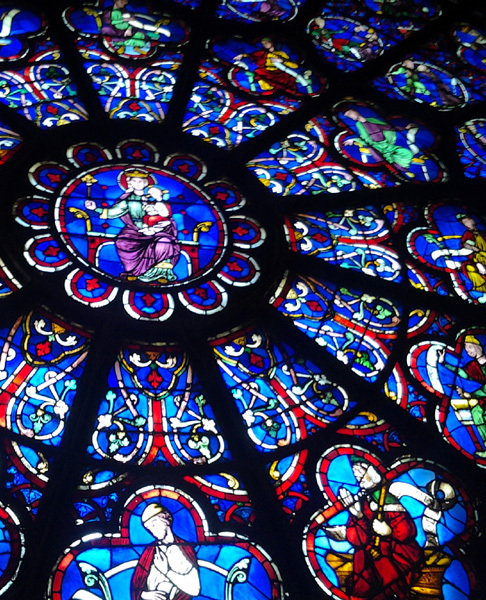 The history of Notre-Dame de Paris' organs begins in the 13th century. From 1357 is attested the presence of the first instrument, "suspended" on a "swallow's nest" under a high window of the nave, and which had to be there doubtless since almost hundred years. On October 25th, 1403, a new organ is ended. In 1618 is appointed one of the best organists of his time: Charles Racquet. With him the instrument will considerably evolve and become the "most modern" organ of the kingdom. 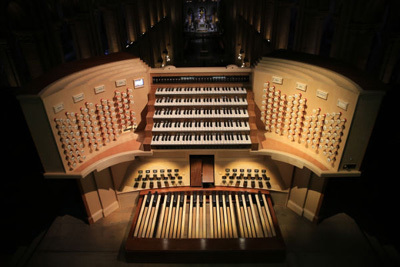 The organ of Notre-Dame is then the first organ with three keyboards built in Paris. The official acceptance takes place in 1620. Médéric Corneille succeeds Racquet in 1689 and, in agreement with the canons, orders, the famous organ builder Alexandre Thierry who joins to Hippolyte Ducastel to do some important works in 1691. A deal is made on may 1691. In 1730 Antoine Calvière (1695-1755) is appointed. As soon as he takes office, he obtains the principle of a complete reconstruction of the instrument, entrusted to the organ builder François Thierry. A big new case is then realized, it is this case which we can even admire today. The instrument contains then five keyboards of 50 notes and was considered for a long time as the most complete French classic organ. In 1783, one call on to the organ builder François-Henri Clicquot. He realizes a general enlargement, with reconstruction of the "positif de dos", (put down in the 19th century at the request of Viollet-Le-Duc, the elements of this case are, since then, preserved in the attic of the cathedral) and extension of the big case up to the side walls by panels "Louis XVI" below, and by big wooden palm trees at the top. The instrument is accepted on May 5th, 1788. A lifting is realized in 1812 by Pierre-François Dallery (1764-1833), successor of Clicquot. The foundation stops are partially revoiced. In 1833 a restoration, undertaken by Louis-Paul Dallery, son of Pierre-François, already modifies the classic organ. These works are accepted in 1838 and the Flutes, top of Oboe, Cornet of Bombarde are praised . 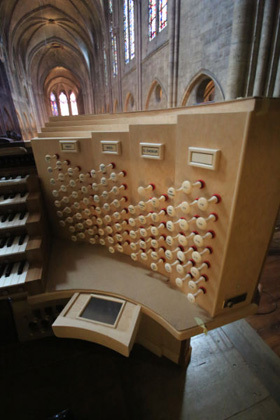 When he arrives at Notre-Dame, at the request of the architect Viollet-Le-Duc, Aristide Cavaillé-Coll makes a project of a "first-rate instrument with four keyboards and pedalboard sufficient for the size of the church " which is delayed in March, 1860. Finally Cavaillé-Coll is chosen on December 23rd, 1862 and the order passed on July 15th, 1863, with promise of completion in two years. But a few months later, Viollet-Le-Duc decides to cancel the "positif de dos". Released of any constraint and without particular directive of the architect, the organist or any committee, Cavaillé-Coll rethinks completely the internal arrangement of the instrument, by integrating all the stops of harmonic transformations going to the Seventh, into eight, sixteen and 32 feet of resultant. The great organ of Notre-Dame includes then 86 stops, distributed on 5 keyboards of 56 notes and a pedalboard of 30 notes. Following the death of Sergeant, Louis Vierne gets the organist's appointment and obtains rather fast a lifting of the instrument realized in 1904 by Charles Mutin, successor of Cavaillé-Coll. New works are then undertaken by Joseph Beuchet, new manager of the Company Cavaillé-Coll, with, particularly, the modification of the keyboards' order in the console. The instrument so revised is inaugurated on June 10th, 1932 by Vierne and Widor. At the beginning of the 1960s, new works are envisaged, at the instigation of the new organist Pierre Cochereau. Modifications are accepted and some unsatisfactory transformations of the previous restoration are partially canceled. The works are entrusted to Jean Hermann who made the maintenance for several years of the cathedral's organs. A new console is organized, the former console is then deposited to the Museum of the "rue du cloître Notre-Dame". It is today presented in a room of the south tower by which we reach the organ. Pierre Cochereau has the intuition to refind on this occasion the Big Plein-Jeu of the organ of the 18th, the classic Cornets (the reeds of the 18th being always present) and to compose in Notre-Dame an instrument witness of the French organ's history. Two events are going to help him there : the decision of the Cathedral's chapter to endow the restoration of an additional budget, which is so added to the credits of the State, and the meeting with Robert Boisseau, who succeeds to Jean Hermann who died in 1965. - Two new windchests are arranged in the side turrets for additional stops of Pedal (complements to the harmonics of Cavaillé-Coll since the Tierce 3 1/5 up to the Piccolo 1, Mixture, the Cymbal and the reeds with shortened bodies). The works will spread out over several years up to the implementation of a series of Chamades: Trompette 8, Clairon 4, Régale 2/16. Maintenance of the gallery and the existing decoration. Restoration of all the musical parts (windchests, pneumatic stop action of Cavaillé-Coll, wind supply, pipes, mechanical parts). Copy of the Cavaillé-Coll's stops removed during the former restorations (in particular : Viole de gambe 8 et Octave 4 of the Great-Organ, Octave 4, Quinte 2 2/3 et Clarinette 8 of the Solo). Restitution of the harmonic progression of the Great-Organ (Mixture II-V,Cymbale II-V avec Tierce). Maintenance in their Clicquot voicing of several stops of the «ancient organ», witenesses of the history of the Great-Organ, to avoid a new damaging of these pipes, transformed a first time by Cavaillé-Coll, and which Robert Boisseau and his son Jean-Loup had returned to their state "18th" (trebble of Hautbois and Cornet of Solo, Montre of Solo). Corrections of the voicing of altered stops and modern stops and return to a sound coherence of the group. Settlement of two stops in Chamade, in copy of the chamade of the organ Cavaillé-Coll of Saint-Sernin in Toulouse, to crown the tutti « Cavaillé-Coll ». Deletion of the obsolete electric transmission and its numerous cablings and accessories. Implementation of an electronic transmission to endow the instrument of widened possibilities regarding combinations, regarding stops' transfers between the various keyboards, but also regarding regulation of the touch to personalize this one according to the organist's willing. Replacement of the console while keeping the keyboards, pedalboard, buttons of registers and the bench. After an international public tender, the market is attributed to a group of organ builders piloted by Jean-Loup Boisseau and his partner Bertrand Cattiaux with Philippe Emeriau, Michel Giroud and the Synaptel company for the computing. The works, begun in May, 1990, end in November, 1992. Notre-Dame de Paris' organ is an Aristide Cavaillé-Coll's work and was reshaped by Robert Boisseau. Electrified under Pierre Cochereau's appointment at the beginning of the 60s, the instrument was restored thus fundamentally in 1990-92. The works proposed today consist of a lifting with technical modernization and not a thorough restoration, the organ being considered as restored and ended in the musical plan since 1992. On one hand, big works maintenance are undertaken in the instrumental part. Confortations of restoration are also to be made, with, first of all, the consolidation of the facade pipes which collapse, consolidation realized partially in 1992 but which it is necessary to redo by going farther because the process of degradation of the pipes continues. These works of lifting justify themselves after 20 years because the organ is intensely used (several hours daily). On the other hand, the computer system of note and stop action created by Synaptel, stayed in the state of prototype, was totally replaced. The architecture of the new system created by the company Eltec-automazioni of Cuneo (Italy), is established on the resources of the computing of today. 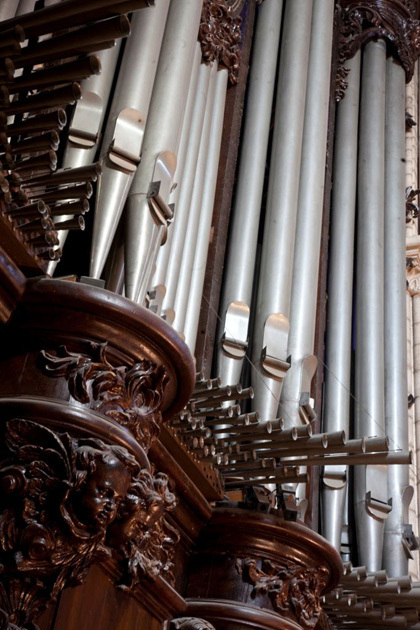 Notre-Dame de Paris' organ is used as a contemporary instrument today and there is a real conflict between the concerns of patrimonial preservation and the constraints connected to the use of the instrument. It leads to ask the question of a technical evolution of the stop action, the majority of which (80 %) are based on the use of the pneumatic machines of Cavaillé-Coll. These machines get tired at an accelerated rythm and after 20 years of observation it seems preferable to preserve them without requesting more of them and to place on registers, a system with pneumatic jacks, what allows to keep as it exists, the very beautiful machinery with its impressive routes of Aristide Cavaillé-Coll's action. Finally, it is decided to widen the tessitura of a part of the Pedal (small modern Pedal of Boisseau), so as to be able to take advantage of this sound plan in optimal conditions. By widening this sound plan from 32 to 56 notes, we shall obtain then a floating additional plan which can be coupled with the manual sound plans. These modifications implied an evolution of the console to adapt itself to the new electronics, to the new functions and to the increase of the number of stops. The first step of the works which concerned the change of all the electronic, the creation of new windchest for the Echo, the dust removal and general tuning is finished today. The organ is again in service, the jubilee of 850 years of the cathedral making impossible any immobilization of the organ between September 2012 and January 2014.